…Or any other big awards. The Disaster Artist is nowhere near movies that aim for them. It is not about black people, gay, or other Oscar-winning “masterpieces” that only the Academy critics seem to enjoy. It is not about growing up either. Has there been any other idea that brought the golden statuette to a movie in the past 7-ish years? Probably not. 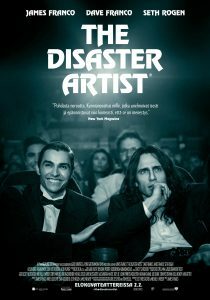 The Disaster Artist is, however, a masterpiece and it’s likely to be James Franco’s best movie, both as an actor and a director. It is definitely the highlight of his career. The other actors, including James’ brother Dave and Seth Rogen (whom we are used to seeing in comedies playing hilarious characters), did their best to shine, but the light (forgive me the metaphor), emanated from James, easily destroyed all Dave’s and Seth’s attempts to impress. Don’t get it wrong, they both played really well. Now just imagine the level of performance shown by the lead actor. It’s difficult to remember something as amazing since Hugh Jackman’s Wolverine in Logan. As a director, James Franco worked on all the details so hard that you don’t need 3D or anything to actually BELIEVE that the story is real. It’s not outstanding because of new solutions or neat tricks. It’s outstanding because it’s so… simple and good. The movie tells us a story of Tommy Wiseau, the man who is famous because of The Room (2003), the movie that is known as one of the worst films ever made. The Disaster Artist shows us all the stages from creating the idea and pre-production to what happens after The Room is filmed. The Disaster Artist is a perfectly written, beautifully filmed and brilliantly played tragicomedy that you will absolutely enjoy with an incredibly low budget for Hollywood. Even if it isn’t going to win any statuettes and awards, it will totally win your hearts. Five stars just because the printer can not print six.